Sudan: No to rule of the generals! Algeria: Bouteflika quits - No trust in the old elite and the generals! Power to the revolutionary workers and youth! Will the EU elections shake the “European project”? "Let's use Bernie's 2020 campaign to launch a mass, working-class fightback"
Algeria: Bouteflika is finished but not yet the Algerian revolution! Is it a choice between nationalism and Europe? Between the far-right and democratic rights? Or is there more? The Tories imploding over Brexit: general election now! For a Corbyn government with socialist policies One in ten British adults says they trust MPs to do the right thing by the country over Brexit. Why so many? Most of us don't trust them to do the right thing about anything! Postal workers in Serbia are on strike. Socialistworld.net has written before about the difficult conditions workers are faced with, followed with solidarity actions. Workers in Serbia feel isolated, so any messages of solidarity will be greatly appreciated (details below). What is behind the new found indignation of the US and other governments over China’s repression of its Muslim minorities? Spanish State: Capitalism is killing the planet! Only socialist planning can save the planet: Build a mass working-class struggle to achieve it! England and Wales: Austerity kills! China – US: Can the trade war be halted? Estado español: ¡El 8M hemos vuelto a hacer Historia! 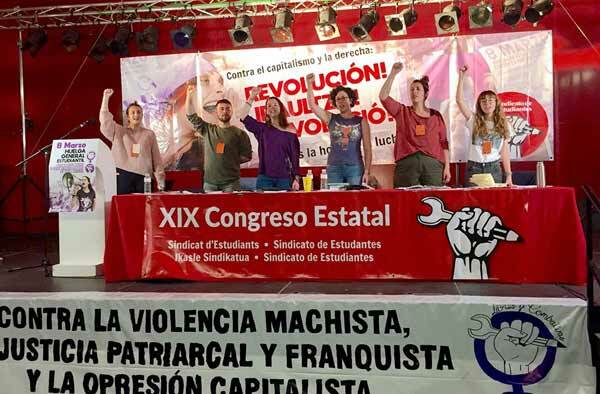 Estado español: XIX Congreso del Sindicato de Estudiantes • Contra el capitalismo y la derecha: ¡Revolución! ‘Feminism for the 99%’- A manifesto to change the world? Spanish State: Historic 8 March action! Britain: Extinction Rebellion protests - How to save the planet?